These two games were characterized by decent Bulls pitching, but absolutely pitiful Bulls hitting. Yes, some can be attributed to the Bisons’ pitching crew but just five hits over two (7 inning) games and only one double, is simply not very good. Even more worrisome, it appears to be part of a trend. 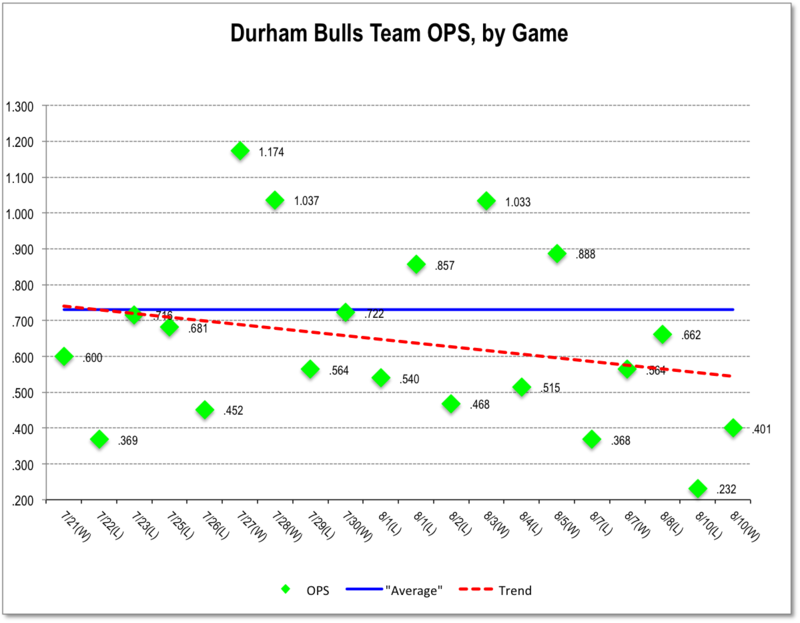 As the chart below shows, not once in the home stand did the Bulls hit above average on the OPS stat. The two games they did win were 1-0 shutouts. Another troublesome stat: the Bulls struck out 44 times over the last five games and only drew 8 walks, a hint of some collective anxiousness. Seems like hitting coach Dave Myers has some work to do. Will having Wil Myers around for a while matter? Who knows? He does get to wear the shiny major league batting helmet instead of the toadstool that minor leaguers have to wear. There’s an oddity to add to the concussion controversy. In baseball it’s the players who insist on inviting concussion, apparently because the safer helmets required of minor leaguers just don’t look right on those studly guys. But I digress. Myers did get one of the two hits in game one as DH and will apparently be “reporting” to the Bulls in Rochester. Not sure what that means. Nate Karns looked OK in game 1. With a little run support he might have done better. In game 2, Alex Colome actually looked to be struggling, but he was whistling in his fast ball and, mostly, keeping it under control. Remember a couple of weeks ago when we huddled in the stands and watched the rain come down on a fairly dull game? It was on 24 July in a game against the Rochester Red Wings and Red Wings had scored just one run on 5 hits in 4 innings against Alex Colome. The Bulls were hitless over three innings. Jayson Nix was in the lineup and had been in the middle of a double play. Box.